Explorers Charles John Andersson and Francis Galton were the first Europeans to record the existence of the Etosha Pan on 29 May 1851. They were travelling with Ovambo copper ore traders when they left Omutjamatunda (now known as Namutoni) to travel north. The name Etosha means Great White Place. In 1885, entrepreneur William Worthington Jordan bought a huge tract of land from Ovambo chief Kambonde. The land spanned nearly 170 kilometres from Okaukuejo in the west to Fischer's Pan in the east. Jordan gave 2 500 hectares of this land at no charge to Dorsland Trekkers who were on their way back from Angola. However, they had to abandon their newly-acquired farms just a year later, after clashes with a subtribe of the Ovambo people. At the same time German troops occupied Okaukuejo, Namutoni and Sesfontein in order to kill migrating wildlife, this in an attempt to stop the spread of rinderpest to their cattle. A fort was built by the German cavalry in 1889 at the site of the Namutoni spring. On 28 January 1904, 500 men under Nehale Mpingana, chief of the Ovambo subtribe that drove the Dorsland Trekkers out, attacked the German Schutztruppe at Fort Namutoni and completely destroyed it, driving out the colonial forces and plundering their horses and cattle. The fort was rebuilt and troops stationed there once again when the area was declared a game reserve in 1907, Lieutenant Adolf Fischer of Fort Namutoni became the first game warden. 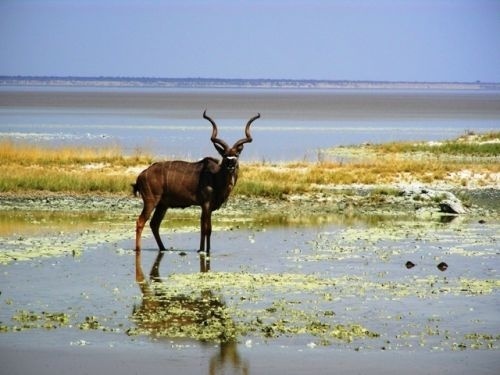 Etosha National Park is Namibia's most famous and popular national park, partly because it is malaria free. The park has an abundance of game and about 340 bird species have been counted. Game viewing is easy as most animals come to drink at one of the few watering holes. It's only after heavy rains that the Etosha Pan fills up and becomes a water source for wading birds and other animals. This is also the time when the bulbs flower. Buck species. Elephant. Giraffe. Rhino and lions. The main camps (Okaukuejo, Namutoni and Halali) offer a good variety of accommodation while Onkoshi and Dolomite are exclusive camps. Namutoni Camp has the best shade. Most people regard the waterhole at Okaukuejo as the park’s star attraction, especially at night when elephant, rhino and lion come down to drink. All three main camps (Okaukuejo, Namutoni and Halali) have fuel stations. Take note: Garage or Petrol cards will no longer be accepted as a legal tender for purchase of fuel, spares or repairs in Namibia. Cash, Debit and Credit cards are accepted at most fuel stops in the larger and touristy towns. Just always take extra cash with in case they only accept cash! The campsite gates open with sunrise and sunset - so it works with the park/main gates and changes weekly. All entry gates work according to sunset-sunrise. So if you arrive late, you can’t get in. 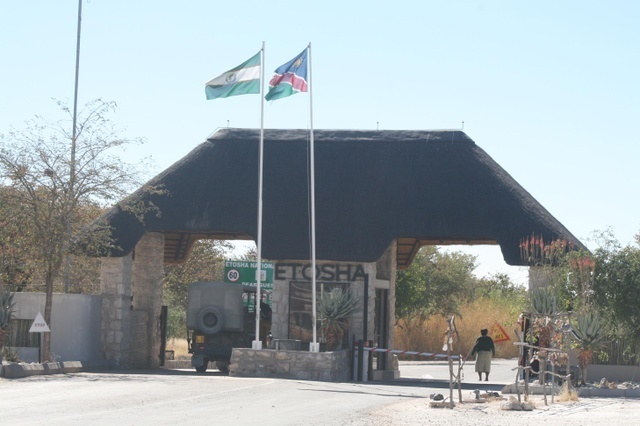 Galton Gate and the associated West Etosha route is now open to self-drive tourists. Self-drive visitors can also use Namutoni Gate / Von Lindequist Gate in the east, Anderson Gate in the south or King Nehale Gate north of Namutoni. All gates open sunrise and close sunset. The gate times are quite specific and vary according to season - find the exact times on the Etosha National Parks website. There is a basic clinic on-site with 2 nurses, first aid box @ reception (Okaukeujo Camp). You can take meat from south to north in Namibia. There is a vet fence that runs along the Etosha border. So you can go into Etosha with meat, but not out. Officials at the gates may check or ask you if you have any meat when you exit the park. On entry you may be asked to sign to confirm that you know you may not take meat out of the park. If you exiting at Galton gate you can buy meat again in Kamanjab, if exiting via Anderson gate, you can buy again in Outjo, or if exiting at Namutoni you buy again in Tsumeb or Grootfontein. The park is serviced by a good gravel road which can be negotiated in a normal sedan vehicle. However, you are advised to use an SUV or pick-up vehicle during the rainy season. All three main camps (Okaukuejo, Namutoni and Halali) have restaurants and shops with basic food supplies. Okaukuejo has laundry facilities. You're allowed to take raw meat from cloven-hooved animals and unpasteurised milk into Etosha if you travel from the south. However, veterinary fence restrictions don't allow you to take it out past the same control point, unless the meat is cooked.